Captain Mark Wallace says Glamorgan are "very capable" of salvaging a draw on the final day against Kent in Cardiff. Glamorgan will resume on 101-2 after being set a mammoth victory target of 554, although bad light wiped out the final session on day three. "We're behind the eight-ball as we have been for most of the game," he said. "We caught a bit of a break with bad light helping us out in the last session so we've got eight wickets to bat it out." Wallace added: "It's still a good pitch as Kent's batsmen showed and our batsmen showed at the start of our second innings, so we're very capable of batting out for a draw." 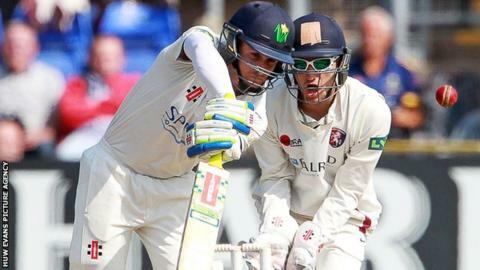 James Kettleborough (52 not out) and Colin Ingram (42 not out) halted Kent's victory march with a stand of 78 after Glamorgan again lost early wickets. Earlier Kent had cruised to 451-2 before declaring just after lunch on day three, with Rob Key hitting 158 and Joe Denly making 161 not out. The target of 554 left Glamorgan needing far in excess of their previous best fourth-innings championship chase of 367. Stand-in skipper Wallace welcomed Kettleborough's highest score for the club after being out of the championship side since May. "Ketts's performances for us in the first-class game this year have shown he's got the ability to be a first-class opener," Wallace told BBC Wales Sport. "He's just been getting to 20 and getting out without quite being able to kick on. Luckily this game he's got to 50 and hopefully there's plenty of batting ahead of him tomorrow." Glamorgan managed to hold on for a draw after starting the final day with one wicket down in Canterbury in May, so Wallace knows they face a similar task in the return fixture. "There are still good balls out there, you've got to be on your mettle as a batsman and the first half-hour tomorrow will be hard work but it's a good surface. "Bbut we're confident of being able to do that (bat through the day)."